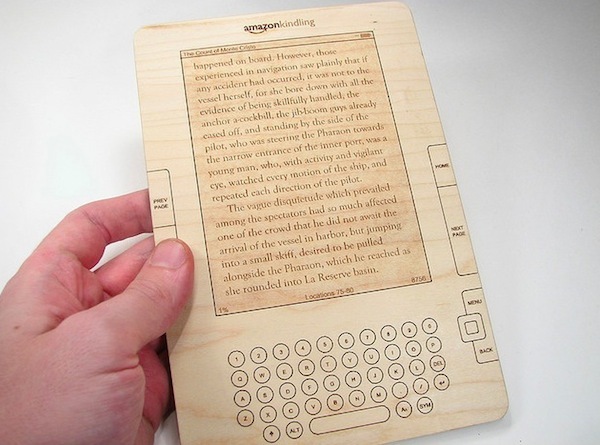 E-books realize their unbound potential faster than expected as pixels push past paper in Amazon sales. Oh, and, hey, look! Kindles for sale! Since April the first, for every 100 print-and-paper books Amazon has sold, it’s also sold 105 e-books, according to a fresh Amazon announcement. Kindle e-readers arrived, along with a small but fast-growing digital bookstore, in November 2007–by July 2010, Amazon notes, Kindle book sales had surpassed hardcover book sales, and then six months later beat the paperback books sales rate. Now Amazon’s customers are “choosing Kindle books more often than print books. We had high hopes this would happen eventually, but we never imagined it would happen this quickly,” says CEO Jeff Bezos, comparing Amazon’s 15-year heritage of selling physical books to just four years of e-book sales. This is far from the end of the road for the ink-and-paper. The fact that buyers at Amazon are now buying Kindle books at a rate that’s already three times faster than they did for the same period is pretty astonishing, and the fact that sales now beat physical books is a huge sign of the change in reading habits. But even considering Amazon’s reported sales trends, it’ll take years yet for physical books to be relegated to a tiny minority, which also assumes the incredible growth in e-book sales continues at its current rate. Plus there’re many fans of the paper book that’ll probably never fully switch to buying only e-books. Why would they? The book has been with us as a technology for millennia, in different formats, and it has an important role in all our societies (easy to wave Chairman Mao’s little red book, much less meaningful to waggle a Kindle in the air…swearing on an e-Bible on a Kindle in court, and so on). But the writing is on the wall for the paper book, for sure. Interestingly, Amazon also mentions that the ad-supported $114 entry-level Kindle is now the best-selling version–which we guess answers that thorny question of “would readers tolerate ad-supported e-books?” with a largeish “yes, they would.” And this could also hint that how we think about the construction of a printed e-book may be changing too.